Among the consequences of a siege mentality are black and white thinking, social conformity, and lack of trust, but always looking at the worse case scenario’s, a strong sense of social cohesion and things tend to manifest in great or really bad decisions, (there seems to be no in between). I’d argue that in business it goes deeper than a ‘collective’. Yes, without a doubt, it can happen when a larger business is getting ‘battered’. Just look at the retail sector on the British High Street as a classic example. Some businesses have come out the other side and have excelled whilst others have made odd decisions or even worse, none at all, and have ended up folding. But when you are a solo entrepreneur or business owner you too can develop a siege mentality. For some it can manifest it’s way by people looking forward to ‘hump-day’ on Wednesday and dancing ‘round the house on a Friday at 5pm. For others it seems to manifest itself into a virtual ‘lockdown’. Nothing gets done. Things get put off. Moving forward seems to be not an option. Others just retreat into their business with no networking, no training, no product or service development and just go quiet. You know how it feels, the fires are burning all around you and you feel like you are constantly spending all your time and energy just trying to put them out. Some get a buzz from that, but eventually it becomes tiring. You cannot see the wood for the trees and there seems to be no way out of your current circumstances. You have little time to focus on what you really want, and everything you do feels like an uphill struggle. Unfortunately this mind-set can engulf not just our business lives, but into our business life too. In fact, if you are a freelancer (or entrepreneur), the two can often be virtually impossible to distinguish between, as one will almost inevitably affect the other. When we are stuck in a rut or negative way of thinking, when things are not working out, siege mentality can literally take over everything and make life look very bleak indeed. But what to do? You cannot make your problems disappear with a magic wand and there is no ‘magic bullet’, (there are plenty of ‘guru’s out there selling you the emperors new clothes and telling you how they made money of the back of people’s naivety), but you can take action. Of course if it is impossible to take any further action, then there is little point worrying about it any longer as you have done all you can. Sounds easier said than done right? From a personal perspective it can feel safe to withdraw and blame your situation on others. However you simply cannot do this in a business environment or inevitably your business will fail. The amount of businesses that are blaming ‘Brexit’ for not doing this, or not doing that. Logically that’s ridiculous right? The day after Brexit, we will still wake up. The sky won’t have fallen in. Food will still be on the shelves and your business will still be there. The problem, if there is one, is that we don’t actually know what it is. So if we’re thinking bleakly about business and what may or may not happen, surely the better thing to do is carry on as normal OR be more positive and move forward, because your competition aren’t. The only way to break siege mentality is to do the one thing it seems counter intuitive to do. Let down the draw-bridge, fling open the windows, open your mind and let it all in and then go out and explore the world. And I mean, really explore, gather the data, find all the facts, observe what’s going on, because you do have options. Once you start clearing the way of the old debris, old ways of thinking and negative emotions, new options always appear; it’s just a form of natural law! It might be that you just need to try a new workable system of doing things, or your strategy needs tweaking, or perhaps you need to move on and try a completely approach. But whatever happens.You cannot stay inside the castle of your business any longer or you will be overcome. Perhaps not by a garrison invading your castle with medieval weapons, but by your own lack of action and fear. The business world is not out to get you, but it will keep on turning, whether you are with it or not. 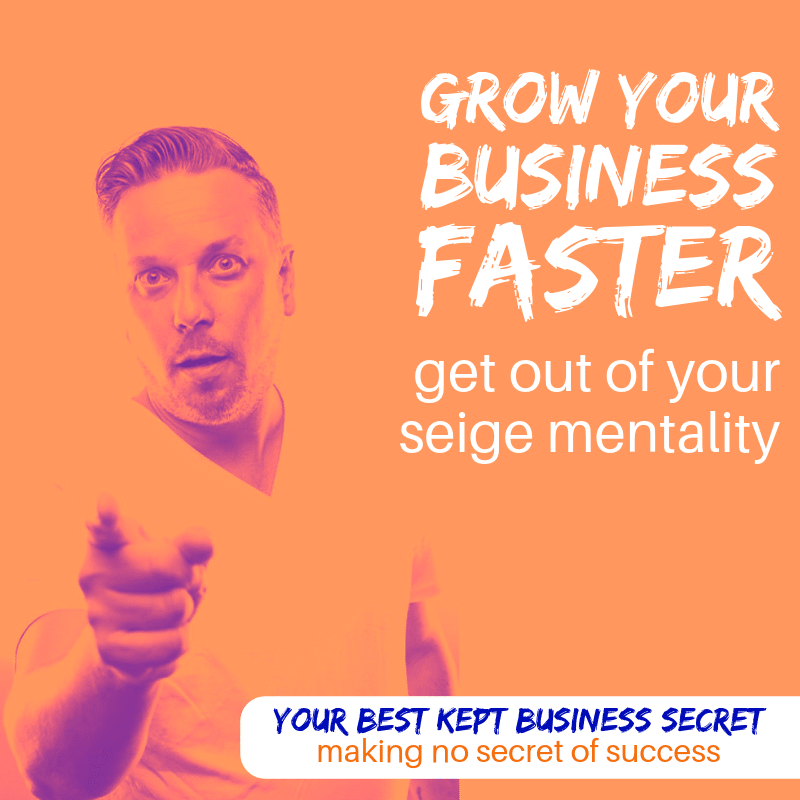 So prepare your best smile, your best pitch, your best ideas and your best strategies, because the business world is waiting for you….and so are the customers you need to continue to grow. Join the Online Community NOW! It’s like having the best kept business secret in your pocket!